While the news of mass movements in the USA and in some (not all) parts of Europe is dominating the news, a very significant struggle — with direct roots today and throughout history in Chicago's most reactionary corporate centers — is taking place in Chile. There, hundreds of thousands of workers and students are fighting to restore public education to the public — nearly 40 years after Chicago's "free market" economists brought the marketplace to Chile behind the torture chambers and bayonets of the Pinochet dictatorship. And the Chicago connection continues to this day, with Paul Vallas working in Chile as one of the consultants to the current reactionary government. 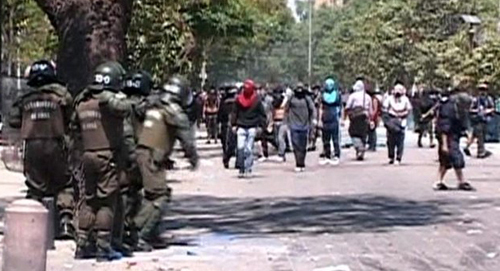 Chilean police used riot control tactics including water cannons after massive protests over the cost of education resumed in October 2011, following earlier protests in August 2011.By October 19, 2011, press reports in English and Spanish were indicating that the number of protesters in Santiago had reached 60,000. The government, which claims it has to impose "austerity," has refused to restore higher education for all the people, remaining stubbornly committed to the capitalist "reforms" that came to the nation following the brutal coup d'etat of September 11, 1973 and in its aftermath. In 2011, the problems facing working families and children in Chile sound familiar to anyone following the protests across the globe. One news report said: "In Chile, a country where half of households live on less than 900 dollars a month, higher education costs thousands of dollars per year, even at public universities. Student loans are priced at higher-than-market rates, and many students graduate with debts of 40,000 dollars or more in a country where per capita income averages 15,000 dollars." 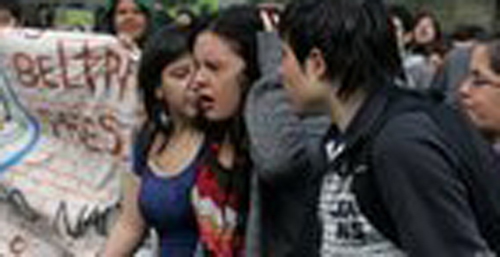 Both police and students have been reported injured as protests against the cost of higher education continued in Chile on October 19, 2011.The so-called school reforms on the last 40 years in Chile were pioneered during the dictatorship, then brought to other nations following their implementation in Chile. Chicago was the first major city in the USA to get the same reforms, when in 1995 Mayor Richard M. Daley got dictatorial control over the city's school system and appointed his former budget director as the Chicago Public Schools first "Chief Executive Officer." That CEO was Paul Vallas, a man who had spent his life in patronage jobs for the Illinois and Chicago Democratic Party, although the corporate school reformers portrayed the problems of Chicago's public schools as being in need of someone with "business experience." Vallas had none at the time he became the first CPS CEO in 1975. 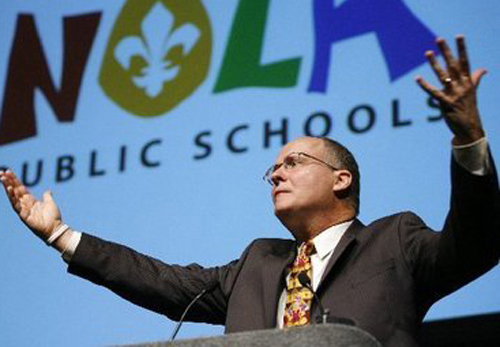 Following his ouster in Jun 2001, Vallas was given the top job in the school systems of Philadelphia and New Orleans. At each stop in his career, he was given enormous resources by the corporate leaders locally, and corporate media repeated his versions of reality, despite scandals in every place. News reports indicate that Vallas and his "team" (which includes several former Chicago administrators) would be working in Chile to bring what amounts to "Race To The Top" to the country that suffered under a brutal dictatorship for more than a generation following a coup d'etat (and the assassination of the President, Salvador Allende) on September 11, 1973. Vallas will follow in the wake of the first generation of the so-called "Chicago Boys." At each point in his career as a corporate "school reform" bureaucrat, Paul Vallas has had the support of corporate media. In each place where Vallas has been in control of the schools (Chicago, Philadelphia, and New Orleans) subsequent investigations showed that Vallas's "reforms" had been corrupt and his claims a pack of lies. Because of his support for privatization, union busting, charter schools, and the "free market" in public education, his career has nevertheless soared. Most recently, a consulting group headed by Vallas received a half million dollars for help with reform in Chile. The "Chicago Boys," backed by the CIA, were a group of University of Chicago economics students who were dispatched to Chile to force so-called "free market reforms" on the country. The "reforms" included massive privatization, charter schools, and the denial of full education rights to the majority of the children of Chile during the 1970s, 1980s, and into the 1990s. Vallas's promises to Chile, as reported in the press, include bringing a version of the "Race To The Top" turnaround project. Vallas has said that he would propose closing the 2,000 "failing schools" in Chile as part of reform. But you won't read this story in the corporate North American media. The following comes from Aljazeera. Protesters threatened to continue demonstrating overnight [on Tuesday, October 18, 2011] — thousands are expected to take to the plazas this evening — and into the day on Wednesday. NEWS REPORTS FROM NEW ORLEANS IN FEBRUARY 2011 REPORTED THAT VALLAS WOULD BE PAID A HALF MILLION DOLLARS TO HELP 'REFORM' CHILE'S EDUCATION SYSTEM. The following story was reported by the New Orleans Times Picayune on February 21, 2011. Recovery School District Superintendent Paul Vallas has signed a contract that will pay his consulting group $500,000 during the next five months to overhaul low-performing schools in Chile. In Chile, Paul Vallas and his team will target the country's 2,000 lowest-performing schools, helping to select curriculum and design ways to monitor student and teacher performance. The money will go toward salaries and travel expenses for a staff of 17, which may leave little left for his own pocket, Vallas said. Vallas has said he will begin transitioning out of his New Orleans job sometime this school year, as soon as he receives permission from his boss, state Superintendent Paul Pastorek, who is searching for a successor. For about a year, Vallas has been traveling regularly to Haiti to develop a plan for remaking the schools in the impoverished, earthquake-ravaged nation. After Chile also experienced a devastating earthquake last February, Vallas began offering his expertise there. Both projects were coordinated by the Inter-American Development Bank, which signed the $500,000 agreement for the Chile work with Vallas on Feb. 1. Vallas' RSD contract, which pays him about $300,000 a year, does not forbid him to do outside consulting. He has made no secret of his eagerness to move on to international consulting after more than three years of shepherding New Orleans' post-Katrina transformation into the nation's first majority-charter school city. But the Chile contract marks the first formal, paid arrangement for Vallas' work abroad. With four members of his team on the ground in Chile, Vallas can supervise the project from New Orleans, but he plans to fly to South America once a month. He will spend the Mardi Gras holiday there. He said his travels to Haiti are on hold until the country's presidential election is decided. His duties at the RSD will be handled by "a very strong leadership team" when he is out of the country, he said. If he exceeds his vacation time, he will take unpaid time off. "I'm still splitting my time between New Orleans and the Haiti and Chile projects," Vallas said. "Obviously, this is the age of Internet and Skype, so when I'm not in the country, I address them that way." Pastorek said he is satisfied that Vallas can give enough attention to New Orleans while he plays a key role in school reform in other countries. "I told him he could support Chile and Haiti, but I wanted to make sure he would stay focused on our mission," Pastorek said. "So far, I've been pleased that he's been able to focus on our mission." After Hurricane Katrina, most New Orleans schools were deemed failing and taken over by the state-run RSD. Vallas oversees nearly 70 New Orleans schools, two-thirds of which are independently managed charters. The Orleans Parish School Board retains 16 relatively high-performing schools. Pastorek said he would like to have Vallas' successor in place by the time the Legislature convenes at the end of April. In Chile, Vallas and his team will target the country's 2,000 lowest-performing schools, helping to select curriculum and design ways to monitor student and teacher performance. They will import the "Response To Intervention" program used in many American schools, including many in New Orleans, to give individual attention to students and catch up the ones who are behind. The team, which includes former RSD deputy superintendent Karen Burke and other educators Vallas knows from his time in Chicago and Philadelphia, as well as several European experts, will also focus on teacher recruitment and training. Facing growing food shortages, the government of Salvador Allende placed Chile's President Michelle Bachelet's father in charge of the Food Distribution Office. When General Augusto Pinochet came to power in the 11 September 1973 coup, General Bachelet, refusing exile, was detained at the Air War Academy under charges of treason. Following months of daily torture at Santiago's Public Prison on 12 March 1974, he suffered a cardiac arrest that resulted in his death. On 10 January 1975,Michelle Bachelet and her mother were detained at their apartment by two DINA agents, who blindfolded them and drove them to Villa Grimaldi, a notorious secret detention center in Santiago, where they were separated and submitted to interrogation and torture. Some days later they were transferred to Cuatro Álamos ("Four Poplars") detention center, where they were held until the end of January. Later in 1975, thanks to sympathetic connections in the military, both were exiled to Australia, where Bachelet's older brother Alberto had moved in 1969. In May 1975, Bachelet left Australia and later moved to East Germany, to an apartment assigned to her by the German Democratic Republic (GDR) government in Am Stern, Potsdam; her mother joined her a month later, living separately in Leipzig. In October 1976 she began working at a communal clinic in the Babelsberg neighborhood, as a preparation step to continue her medical studies at an East German university. During this period she met architect Jorge Leopoldo Dávalos Cartes, another Chilean exile, whom she married in 1977. In January 1978 she went to Leipzig to learn German at the Karl Marx University's Herder Institute (now the University of Leipzig). Her first child with Dávalos, Jorge Alberto Sebastián, was born there in June 1978. She returned to Potsdam in September 1978 to continue her medical studies at the Humboldt University of Berlin for two years. Five months after enrolling as a student, however, she obtained authorization to return to her country.